This is one of my favorite decor items that I have made. I did this many years ago and bring it out each Christmas. I followed something that I found in a magazine, so no credit to me for the idea. Anyway, The tree is embroidered using a chain stitch and zig zag stitch on my ordinary sewing machine. My machine came with about 4 or 5 different stitch possibilities, and I used these two. I took a square of plain fabric and pieced together the border in blue around the square. Then I ironed on some interfacing to the backside to keep the fabric stiff for machine embroidery. Using a piece of chalk, I drew the outline for my primitive tree on the fabric, overlapping onto the border slightly. With brown thread in the machine, I used a wide, but tight, zig zag stitch to create the trunk of the tree, periodically making the width of the stitch narrower as I ascended the trunk. 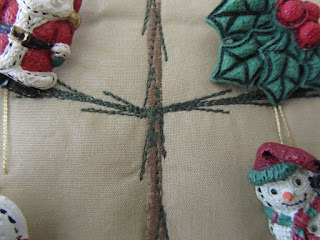 Switching to forest green thread and changing the stitch to a chain stitch, I used both forward and reverse stitching to create primitive branches on the tree, and some needles along the trunk. 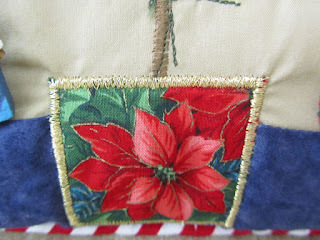 Once the tree was complete, I added a "pot" out of a square of print fabric that it attached with a tight zig zag stitch. 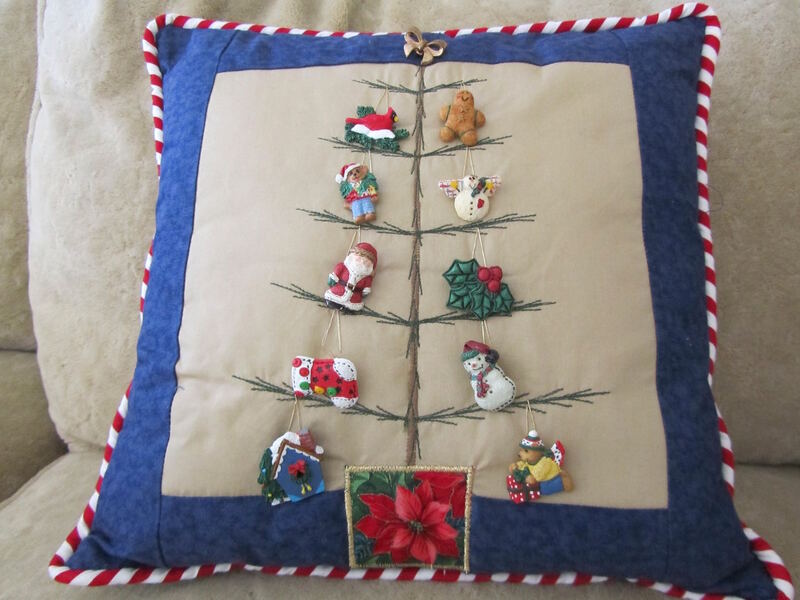 The ornaments and tree topper are buttons sewn to the plain fabric. 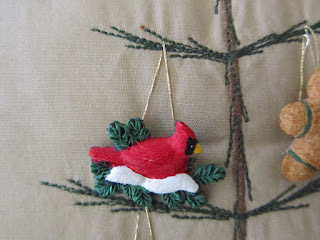 I stitched on gold thread for the "hangers" for each ornament. 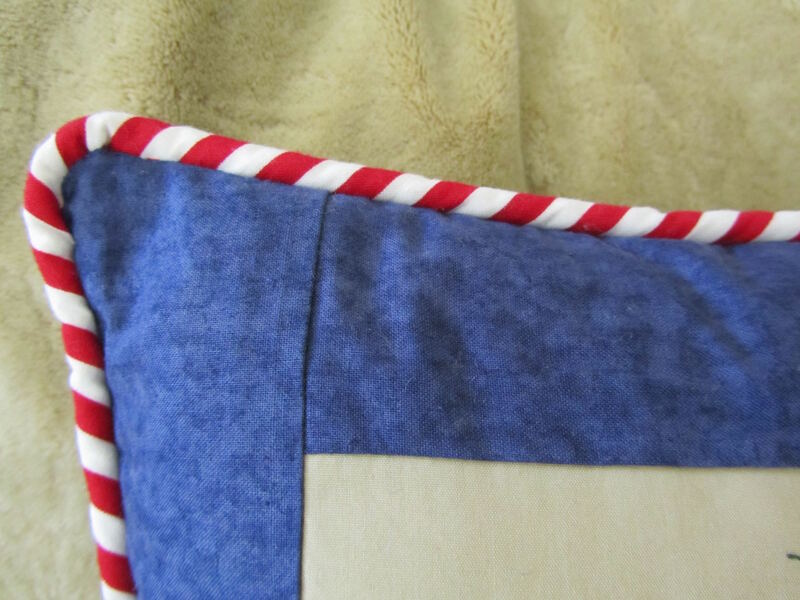 Finally, I made edge-piping out of red and white striped fabric on the diagonal, then sandwiched that in between the front and back of the pillow and stitched 7/8 of the way around, turned right side out, stuffed and hand-stitched the opening closed. 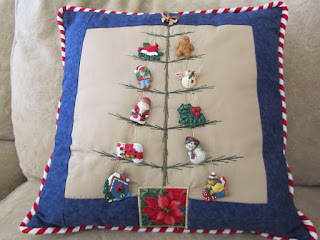 I share this idea because I think the primitive tree design, without ornaments, could be used to embellish a plain fabric for a table runner, napkins, or plain stockings for the holidays. It's simplicity is charming, IMO. That is a really cute idea. Thanks for sharing. I like the blue border with striped piping, a nice candy factory effect. I think your machine embroidery is beautiful. I never tried that yet, but I am anxious to try some free machine quilting using a universal foot I ordered from Amazon, free. Imagine, the foot was so cheap, a little over a dollar, and Discover card credited my account for that amount since it was such a small charge. Wanted to tell you that I packaged and mailed 2 gifts this morning, and I used your card idea on one of them! Often I have to wrap my boxes in brown paper, but the box I used today on one gift was in good condition (bonus!) so I was able to use it as-is and affix the address card to it. Got that job done! On to Christmas cards next ... or should I clean? Decisions, decisions. THat is so cute, Lili. I hope you all have a wonderful Christmas! Lili, hope all is well. Wishing you a happy New Year. Happy New Year! Hope you and yours are doing well.